In 1948, Arthur Warn founded Warn Industries to construct locking hubs for surplus World War II Jeeps. 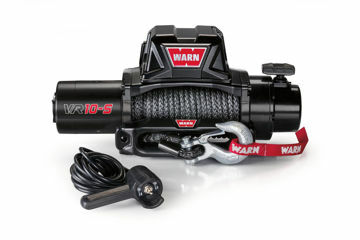 Ten years later, the Warn winch was manufactured to fill the need for a reliable recovery tool to aid off-roaders stuck in challenging situations. Since then, Warn has grown to offer a wide range of gear with the hallmarks of durability and affordability. 1988 spawned the aftermarket industry's first ATV winch and today their PowerSports line of winches ranks among the most esteemed in the industry and jeepers call on Warn for electric, hydraulic and severe duty components that get the job done. Copyright © 2019 Red Rock Offroad. All rights reserved.